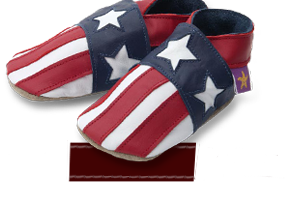 French Chic Baby Shoes - Chaussons et chaussures pour bebe et enfant. Stella Taupe And Grey. Boys soft leather baby shoes with a choc star on taupe shoes. Orchid Taupe And Choc. Girls soft leather baby shoes with orchid flower design on taupe shoes. Brogue Taupe Choc. Unisex soft leather baby shoes, classic chocolate brogue punched and sculpted toe cap and collar on taupe shoes. 50 Percent Mum In Taupe. Unisex soft leather baby shoes, 50 percent mum, 50 percent dad embroidered design on taupe shoes. Elle In Mauve And Grey. Girls soft leather baby shoes. Elle flower in grey on mauve shoes. Lovehearts In Grape And Mauve. Girls soft leather baby shoes with lovehearts double mauve hearts design on grape shoes. Polka Dot In Mauve And Grape.Girls soft leather baby shoes with grape polka dots on mauve shoes. Stars In Chocolate And Caramel. Boys soft leather baby shoes with caramel stars on chocolate shoes. Retro Trainers In Black And Grey. Boys soft leather baby shoes in black, retro trainers style in black with grey lace up and toe cap, baby blue stripes and silver leather stars. Junior Trainers In Choc and Taupe. Boys soft leather baby shoes, junior style trainers in chocolate and taupe. Polka Dot Rose And Colours. Girls soft leather baby shoes with classic polka dots in multi colours on rose shoes. Stars Taupe And Chocolate. Boys soft leather baby shoes with chocolate stars on taupe shoes. Rock Star Grey And Metal. Boys soft leather baby shoes in Grey with Rock Star legend and stars in metal. Guitar Grey. Boys soft leather baby shoes in Grey with silver fender stratocaster style guitar design. Clapton, Hendrix, Curt Cobain and your little rock star. Rosa Taupe. Girls soft leather baby shoes with embroidered pink roses with green petals design on taupe shoes.